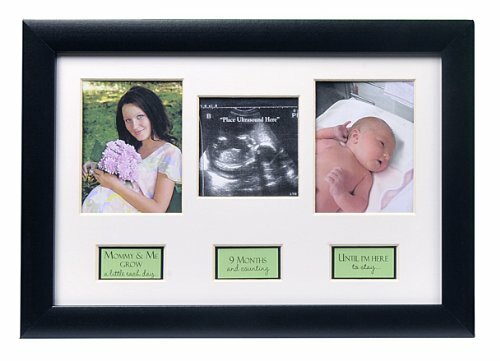 Pregnancy keepsake frame for expectant couples. Categories: Adoption Gifts, Adoptive Parents. 8×12 black wall or table frame with space for pregnancy, ultrasound and newborn photos. A unique and special pregnancy keepsake gift for an expectant mom. Let her tell the story of new life with captions and photos. Captions Read: Mom and me grow, a little each day, 9 months and counting, until I’m Here to stay. Photo openings include 2-3×4 openings for pregnancy photo and newborn girl or baby photo, and center ultrasound opening measuring 3×3. Features white matting and classic black frame to display in any room of the home. Made in the USA. Frame features white matting with 2-3×4 openings and 1- 3×3 center opening for ultrasound image.